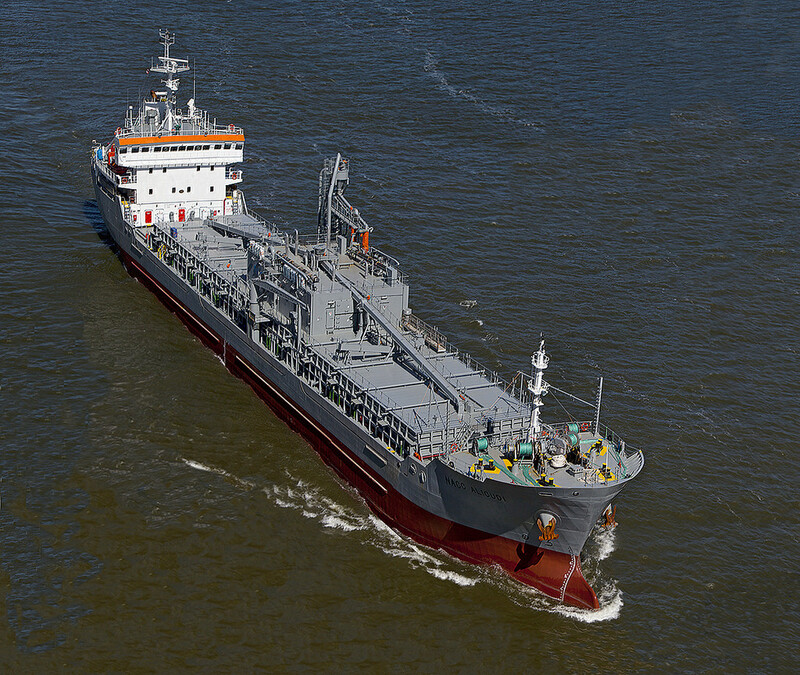 The NACC Alicudi is setting new standards in cement carrier market. The 2011 – built bulk carrier Sider Alicudi, named after the volcanic island between Naples and Palermo, has been converted in 2017 with a Van Aalst dry bulk handling system to become a unique and state of the art 120m self-discharging cement carrier. Now renamed NACC Alicudi, the 8000DWT vessel has directly after completion of conversion entering the trade for the next three years on the east coast of the United States of America and Canada. This area was declared a NOx Emission Control Area (ECA) for newbuilt and converted vessels as from January 2016, and the NACC Alicudi is now compliant with the area emission rules. The new rules under IMO Tier III (NOx Emission Control Areas) envisage a 70% reduction in Nitrogen Oxide as well as Sulphur Oxide emissions from diesel engines, considerably more stringent than the EPA 2010 (USA) and EURO 6 (Europe) legislation. The NACC Alicudi is world’s first cement carrier equipped with IMO Tier III compliant diesel engines driving the bulk handling system. “THE NEW CEMENT COMPANY: High Standards, Customer Conscious, Ecologically Sound”. And puts its money, where its mouth is. The new McInnis cement plant in Port-Daniel-Gascons, Quebec, is state-of-the-art, in every way, and so is the new receiving Bronx terminal in New York. As such, the newly-converted NACC Alicudi is a fitting addition to the overall logistic foot print of McInnis, which already consists of another NovaAlgoma vessel, the NACC Quebec. The Van Aalst cement handling system is based on compressors and vacuum pumps, driven by Tier III Scania engines. Together they form the heart of the unique vacuum-pressure system for pneumatic conveyance of cement, fly ash and granulated slag, as applied in over a dozen of vessels in recent years. The development of the world’s first Scania IMO tier III diesel engines in service has been the fruit of extensive joint engineering of Van Aalst and Scania, resulting into this great achievement. The challenge put forward was to find correct placing of the Scania Selective Catalytic Reduction (SCR) system in engine room deckhouse, which was smaller as the previous non-SCR equipped engine room deckhouse. This resulted into lowering emissions, but also, and very important for the cement carrier owner, the lowering of the height of the loading system and loading points on board the vessel. This has considerable advantages during her operational life, as she can serve an increased number of ports. The Owners NovaAlgoma Cement Carriers are very pleased with this vessel which is a major step forward in emission reduction as well as operational flexibility. The McInnis cement company expressed their appreciation of the delivered performance of the bulk handling system which is performing above contractual discharge rates. This enables McInnis Cement to reduce the turn-around time and increase the annual throughput of the vessel. The high emission standards of the vessel will enable a shift to the NOx and SOx ECA’s of the US Gulf of Mexico, and even Puerto Rico and Hawaii, in future. With this combined technology on board the vessel is well prepared for serving a worldwide emerging cement market for many years to come. Consequently, the vessel has been nominated for the prestigious International Bulk Journal Awards 2018 as Bulk Ship of the Year.